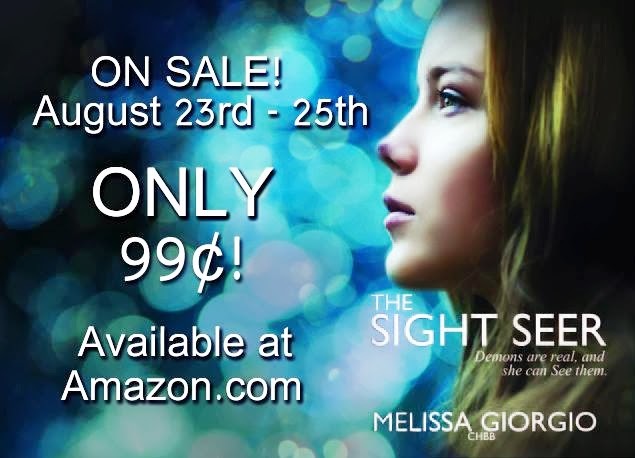 dizzy with words: THE SIGHT SEER, by Melissa Giorgio - On Sale Now! That boy, Rafe Fitzgerald, is a member of Silver Moon, an organization devoted to eradicating demons before they kill humans. If this little bit of news isn't earth-shattering enough, Rafe reveals that he needs Gabi's help. As strong as Rafe is, he does not possess the Sight--a rare ability that allows a hunter to See through a demon's glamour, enabling them to strike before the demon does. But guess who does? While Gabi is reluctant to face another demon, she knows she owes Rafe big time for saving her. Together, they're thrown headfirst into heart-stopping situations as they battle newer and more frightening demons. When she starts to fall for Rafe, Gabi knows her normal life is gone forever.